« Beauty from the Inside Out ~ Foods to Help You Stay Glowing and Gorgeous! My husband and I absolutely LOVE to play board games, dice games and the like and frequently have game nights that can extend into the wee hours of the morning. My family loves dining out at our favorite restaurants and often find that this is the perfect time to enjoy a little family bonding and fun game time before (and even after) our meal arrives. Finding games that we can all play as a family is a little challenging right now though simply because Riley is only 2 years old. This is where Hasbro Games CRANIUM BRAIN BREAKS comes in. This game is actually a collection of 200 different games that can each be played in 60 seconds. Keep reading to learn more and see whether this game was a perfect fit for my family or not! I reviewed the Cranium Brain Breaks Game from Hasbro Games, which retails for $14.99, but is currently on sale for $12.96 with FREE SHIPPING. Only have a minute? 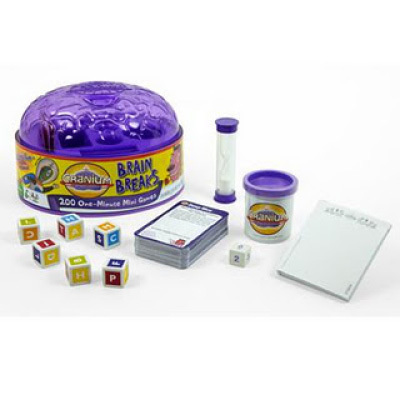 That’s all you’ll need to play CRANIUM BRAIN BREAKS! 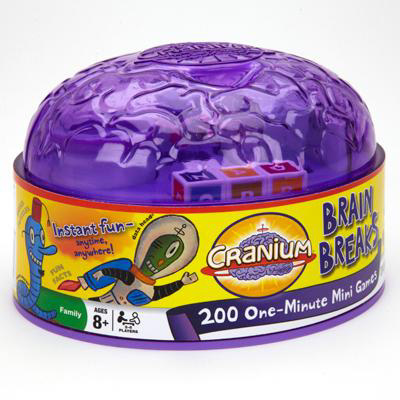 New from the CRANIUM line is CRANIUM BRAIN BREAKS, a collection of 200 different games that can each be played in 60 seconds! The classic categories of Creative Cat, Word Worm, Star Performer and Data Head can be found in this compact case of games, ensuring there is something for everyone. This family friendly game is designed for 2-6 players, ages 8 years old and up. Work together with other players to successfully complete as many activities as possible. See how many game cards can be collected in a row for some added excitement. Players draw a card from the deck and try to successfully complete the activity in the allotted 60 seconds. For example, a Creative Cat card might instruct a player to make a paper airplane and fly it through a ring made out of clay that another player constructs, and all within 60 seconds! Speed is the name of the game! 200 games in one convenient brain-shaped case. Length of game play is customizable. Each game can be played in 60 seconds or less so choose the number of games you want to play and get started! Our family absolutely loved the CRANIUM BRAIN BREAKS game from Hasbro! I threw it into a backpack that we take along when we go out to eat because it contains toys and such for Riley. The game is so small and portable that traveling with it is very easy. Next, my husband and I took turns doing what was listed on each card and Riley would help each of us by operating the timer, rolling a game cube or doing any other task that she could do. Sometimes we adapted the tasks on each card so that she could play right along. We all had a great time (even Riley) and what was really neat was how the game could go on for as long as we wanted. When the food came, it was super easy to pack everything up and chow down. I loved how there were so many different types of tasks that we were asked to do...anything from drawing, to doing exercises to modeling with clay. You never knew what was next! If you love playing games or know a family that does, then I highly recommend the latest edition from CRANIUM...CRANIUM BRAIN BREAKS! This game offers action-packed fun for the whole family, whether you have just one minute or several hours! Disclosure: I received the Cranium Brain Breaks Game from Hasbro Games in order to facilitate my review. No other compensation was received. This product review is based on my own personal experiences with this item and is completely honest and objective.